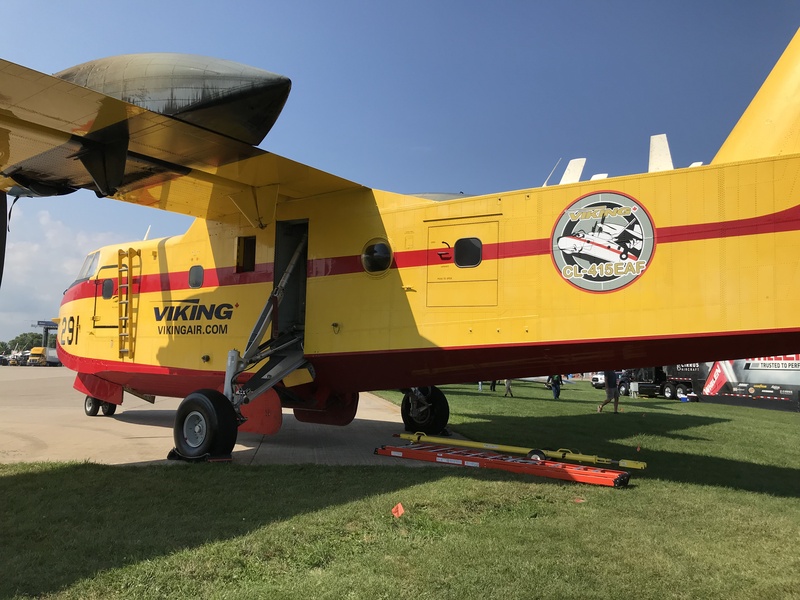 Viking Aircraft brought a CL-215 waterbomber to AirVenture 2018 as part of the aggressive marketing campaign to resume production of the CL-415 EAH, the modernized version of the aircraft. The bright yellow amphib attracted a lot of attention on Boeing Square, the main aircraft display area at the show. Viking also displayed a turbo Beaver at its booth at the show. It was all part of the normal strong contingent of Canadian content at AirVenture. The Canadian Owners and Pilots Association joined Transport Canada and Nav Canada in a comprehensive booth about flying in Canada in the International Pavilion. Diamond Aircraft had a large display and Canadian companies were sprinkled through the exhibit areas. Airbus visited the show with an A220, the former Bombardier CSeries it acquired in a deal just weeks earlier.